Welcome! Thank you for visiting our Physio-pedia page. We are a group of graduate students in the Doctor of Physical Therapy Program from Bellarmine University in Louisville, Kentucky. We have been looking at and performing research related to injuries in rowing. The literature is showing that rowers often experience overuse injuries due to the mechanics of the rowing stroke along with its repetitive motion. And while there are several prevalence studies for elite adult rowers, there have been few studies assessing the prevalence of injuries in high school rowers. We recently conducted a pilot study with the Louisville Rowing Club's high school team (detailed information on this study can be found below) in which we surveyed them on injury prevalence and implemented an exercise program with emphasis on strengthening the core to prevent low back pain. While we obtained some information from this study, we would like to collect more information on injury prevalence in the high school population in order to fill the gap in the literature. In order to attain this information we respectfully ask for your participation in a survey. In the section below, there are links to two different surveys. If you are a rowing coach, please follow the link for the coaches and complete the survey. If you are an athlete, please follow the link for the athletes and complete the survey. Please rest assured that no personal information will be released by participating in this survey. Rowers often experience overuse injuries due to the mechanics of the rowing stroke along with its repetitive motion.1 Among these overuse injuries, the most common occur in the low back, forearm/wrist, and knee.2,3 Evidence has shown that low back pain made up the majority of injuries experienced in junior elite rowers, however there have been minimal studies assessing prevention strategies of this injury in the high school population.2-4 Rowers with less experience are more likely to acquire traumatic injuries.4 During the catch phase of the stroke there are increased rotational and tensile stresses on the low back resulting in increased risk for injury.1 Injury also occurs due to erector spinae fatigue and increased lumbar flexion throughout the rowing stroke.2 Research has shown that circuit training may be an effective exercise regimen for rowers because it simulates the repetitive overload of the rowing stroke, therefore training endurance to prevent low back injury.1 A 12 week study by Chtara demonstrated that a low frequency resistance type circuit training program resulted in significant improvements in muscular strength, explosive strength and power, and strength endurance.5 Rowers rely heavily on both aerobic and anaerobic systems to train power and endurance, therefore circuit training is an adequate method to address these demands. Additionally, it is important for rowers to have a strong core and adequate trunk stabilization to prevent injury. Research supports that retraining the local muscle groups or core musculature is important for trunk stabilization and prevention of low back pain.6 The purpose of this study is to design and implement a specific prevention program for low back pain in high school rowing athletes. This prevention program will utilize circuit training concepts to include trunk stabilization for specific core muscles. Additionally, this proposed study may provide insight on the prevalence of low back pain and other chronic injuries in the high school rowing population. This information could help to fill a gap in the literature. The participants in this study are a convenience sampling of 24 high school rowers, 13 females and 11 males that are members of the Louisville Rowing Club. Rowers ranged in experience from 2 months to 3 years. Ages ranged from 14 to 18 years old. A survey to collect data on demographics, rowing experience, and injury history was completed by rowers before initiation of the prevention program. A modified survey to assess the progress of the program will be given at 6 weeks and at the cessation of the program. Examples of the survey are included in this packet. Generally, rowing requires the use of major muscle groups beginning with the legs then to the back and finishing with the arms. When muscle imbalances or fatigue occur, athletes are more prone to acute and chronic injuries. Research has shown a correlation between core stability, trunk endurance and the reduction of low back pain symptoms.6 Among rowers, management of low back injuries has been suggested to include stretching of the hip extensors, core stability and strengthening, proper pelvic alignment, endurance training of lumbar erector spinae muscles, and neutral postural alignment.2 It is from these concepts that we designed a training program that incorporates dynamic exercises not only addressing the strengthening of the major muscle groups used in rowing, but includes specific activities suggested to prevent low back pain. The training program will be performed once a week for 30 to 40 minute sessions in addition to the team practice schedule, which is held every weekday. The program is broken up into three phases in order to correlate with the physiological responses to long term training. These three phases are known as the anatomical adaption phase, the strength phase, and the maintenance phase.1 The anatomical adaption phase will emphasize low resistance and high volume, so less sets and high repetitions. The strength phase involves a transition to more sets and lower repetitions. This follows the idea that in this phase of strength training, weight is increased, thus repetitions decrease. However, in this protocol, instead of increasing the weight, the difficulty of the exercise is progressed to require more strength and control. The maintenance phase will focus on preserving gains resulting from the strength phase. Exercises in the three phases can be broken up into categories of stabilization, upper extremity, lower extremity, combination, and flexibility exercises. The majority of the exercise activities that make up these categories address muscles that either attach to the spine or contribute to posture and core stability. These interventions were compiled into an exercise bank to be used as a reference in organizing circuit training outlines. Each circuit includes an even distribution of exercises from each category and each circuit is repeated three times within a training session. The phases are made up of three circuits, which are rotated in the weekly session. Researchers were present for the first phase (weeks 1-6). The second and third phase of the program will ideally be distributed and implemented by the coaching staff. Eighteen of the twenty four rowers reported experiencing low back pain during their rowing career. Nineteen of the rowers had been rowing for a year or less. Six people reported an injury other than low back pain that was related to rowing. Four of those individuals reported knee pain, one reported elbow pain, and one reported hip flexor injury. Of the individuals who reported low back pain, greater than 50% of them rowed on both port and starboard side. Twenty two of the twenty three, who reported low back pain, stated their pain was a 5 or less on the visual analog scale. Approximately 80% of the rowers participated in training/practice for 5-8 hours per week. A summary of the survey responses are attached at the end of this document. 1. Do you feel like you have a better understanding of the importance of core stabilization in the prevention of low back pain? 2. Do you feel like you gained a better understanding of proper body mechanics needed during exercises used in this circuit training program? 3. Have you noticed any improvements since the start of the exercise program? Four of the 14 individuals reported that they are currently experiencing low back pain. All pain that was reported fell below 3 out of 10 on the visual analog scale. The major finding of this pilot study was that 75% of the rowers reported experiencing low back as a result of rowing. This finding supports our primary hypothesis that low back pain has a high prevalence in high school rowing athletes. Another interesting finding was that majority of the rowers who reported low back pain had been rowing for less than one year. 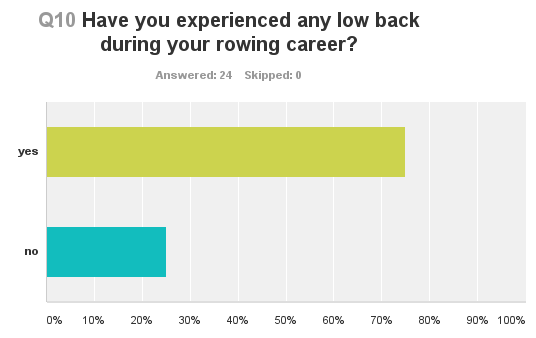 This may suggest that low back pain is common in both experienced and inexperienced rowers. These inexperienced rowers may sustain low back pain secondary to lack of body awareness and proper form during exercise. Researchers observed poor body mechanics and lack of appropriate strength and endurance during the circuit exercises. Specifically, researchers noted increased difficulty with exercises such as dead lift with dumbbells, prone and lateral planks, squats, push-ups, V sit-up, and supermans. Increased difficulty with these exercises demonstrates that these rowers lack adequate core and lumbar stabilization. According to our research, we know that core and lumbar stabilization are essential to prevention of low back pain. We can infer that if these poor body mechanics are used during the circuit, that they will also be adopted when rowing. The combination of these poor mechanics and inadequate core and lumbar stabilization may explain the increased incidence of low back pain among high school rowers. Although positive results were seen from the exercise program, our results are not conclusive due to the limitations of the study. The circuit could only be implemented one time per week with coaching staff at the Louisville Rowing Club. Better results might have been seen if the program would have been implemented two times per week as planned. Also, only one phase of the program was able to be supervised by the researchers. Since the second and third phase will not be supervised by the researchers, there is no guarantee that the program will be continued according to protocol, which will decrease validity of the study. Another limitation of the study was the survey. They survey was too open ended which lead to increased variability of responses and lack of quantitative measurements. There were also no objective measurements that were taken other than the survey that was created by the researchers. In addition, there were 34 rowers who participated in the circuit, but only 24 returned the initial survey and 14 returned the follow up survey. In future studies it would be more beneficial for the program to be implemented two times per week to maximize results. There is a need for higher quality research in this population. The researchers hope for this community partnership is that it will continue to be implemented in the following months by coaching staff. The researchers also educated the rowers on better body mechanics and awareness to help decrease injury occurrence. Ideally, this knowledge will benefit them in their future rowing careers. Our community partnership has helped us to realize that there is a lack of research on rowing injuries in high school athletes. The goal of the Capstone will be to obtain information regarding the prevalence of injuries on a larger scale in high school rowing athletes. MA. Accessed October 28, 2013. 2. Rumball J, Lebrun C, Di Ciacca S, Orlando K. Rowing injuries. Sports Medicine [serial online]. April 2005;35(6):537-555. Available from: CINAHL, Ipswich, MA. Accessed October 28, 2013.
http://www.pubmedcentral.nih.gov/articlerender.fcgi?artid=3435926&tool=pmcentrez&rendertype=abstract. Accessed September 9, 2013. 4. Smoljanovic T, Bojanic I, Hannafin J, Hren D, Delimar D, Pecina M. Traumatic and overuse injuries among international elite junior rowers. The American Journal Of Sports Medicine [serial online]. June 2009;37(6):1193-1199. Available from: MEDLINE, Ipswich, MA. Accessed October 28, 2013. 5. Chtara M, Chaouachi A, Levin G. Effect of concurrent endurance and circuit resistance training sequence on muscular strength and power development. J. Strength …. 2008;22(4):1037–1045. Available at: http://scholar.google.com/scholar?hl=en&btnG=Search&q=intitle:Effect+of+concurrent+endurance+and+circuit+resistance+training+sequence+on+muscular+strength+and+power+development#0. Accessed November 15, 2013. 6. TSE M, McManus A, Masters R. Development and validation of a core endurance intervention program: implications for performance in college-age rowers. J. Strength …. 2005;19(3):547–552. Available at: http://scholar.google.com/scholar?hl=en&btnG=Search&q=intitle:DEVELOPMENT+AND+VALIDATION+OF+A+CORE+ENDURANCE+INTERVENTION+PROGRAM+:+IMPLICATIONS+for+performance+in+college-age+rowers#0. Accessed November 15, 2013. 7. Gee T, Olsen P, Berger N. Strength and conditioning practices in rowing. … Strength Cond. …. 2011;(30):668–682. Available at: http://scholar.google.com/scholar?hl=en&btnG=Search&q=intitle:Strength+and+conditioning+practices+in+rowing#0. Accessed November 15, 2013. 8. Stutchfield B, Coleman S. The relationships between hamstring flexibility, lumbar flexion, and low back pain in rowers. European Journal Of Sport Science [serial online]. December 2006;6(4):255-260. ↑ Allen K, Jones M. Sport-specific conditioning to prevent injuries in rowing. Strength & Conditioning [serial online]. February 1998;20(1):35-39. Available from: SPORTDiscus with Full Text, Ipswich, fckLRMA. Accessed October 28, 2013.